Conversation Of The Week LII: What Lessons Can The United States Learn From Germany In Passing Immigration Reform? BERLIN (AP) - In gritty the backstreets of Berlin and other major German cities, women wearing headscarves shop for lamb and grape leaves. Old men pass the time in cafes sipping coffee, chatting in Turkish, and reading Turkish newspapers. More than 3 million people of Turkish origin live in Germany - the legacy of West Germany's Cold War-era program to recruit temporary foreign labor during the boom years of the 1950s and 1960s while rebuilding the country after World War II. What started as a temporary program changed the fabric of German urban life - from mosques on street corners to countless shops selling widely popular Doener kebab fast food sandwiches. Germany's experience with "guest workers" offers lessons for the U.S. as it debates immigration reform, including whether to provide a path to citizenship for unskilled foreign laborers, or whether there should be additional temporary-only visas for such workers. President Barack Obama urged Congress to begin debate in April after lawmakers return from a two-week recess. 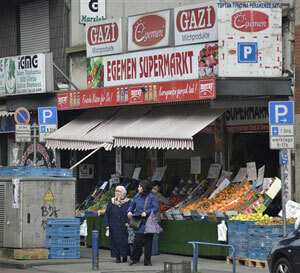 Decades after Germany's formal guest worker program ended in the early 1970s, the country continues to wrestle with ways to integrate Turks - the second biggest group among the estimated 15 million-strong immigrant community after ethnic Germans who moved from the former Soviet Union and former Soviet bloc countries - into German society. "When you bring people to work, it's quite hard to tell them to go back one day," said Goecken Demiragli, a social worker whose grandmother came to Berlin from Turkey in 1968. "That was the biggest mistake: to think that if you don't need them, they will go." Initially, the Germans felt there was no need for an integration path. They foresaw a temporary program of rotating labor, where workers from Turkey, the Balkans, and southern Europe would spend a couple of years on an assembly line and then go home to be replaced by others if the industry still needed them. However, factory managers grew tired of retraining new workers every couple of years and convinced authorities to allow contract extensions. Many immigrants, especially young Turkish men who faced grinding unemployment at home, opted to stay in Germany, bringing their families and building lives here despite discrimination in education, housing, and employment. Although immigrants could stay legally with government-issued residence permits, they could not apply for citizenship for 15 years, although in recent years, the government shortened that period. Without fluent German, and state-supported language programs, many were unable to pursue good education and well-paying jobs. As a result, the Turkish community remains the least integrated immigrant group in Germany, according to the private Berlin Institute for Population and Development. Immigration critics blame the Turks for refusing to abandon their traditions of rural Turkey, failing to learn German, and taking advantage of educational opportunities. Critics note that more than 90 percent of marriages by ethnic Turks are to other Turks - in part because of cultural restrictions against marrying outside the Muslim faith. Over the years, the existence of a parallel society of marginalized people who speak a different language, follow different religious and social customs, triggered a backlash in a country that only recently considered itself a nation that welcomes immigrants. In their campaign against immigration, Neo-Nazis focus on the Turks. Next month, the surviving member of a small Neo-Nazi cell goes on trial in Munich for allegedly killing 10 people - eight of them Turkish immigrants - over seven years. The cell allegedly got away with the killings for years because police assumed the killers were members of Turkish immigrant gangs. Thilo Sarrazin, once a top official of Germany's central bank, wrote in a 2010 best-seller that immigrants were dumbing down German society, and that Turkish and Arab immigrants were reluctant to integrate. The firestorm that followed forced Sarrazin out of his bank post, but his book sold over 1.5 million copies. Others fault successive German governments as being slow to recognize the immigration problem, and only moving in recent years to put in place programs to combat discrimination, provide German language training, and offer a speedier path to full citizenship. "The West German government should have devised comprehensive integration measures as part of family reunification policies, but did not," according to a 2009 study for the Washington-based Migration Policy Institute. "Consequently, integration problems began to take root in West Germany." In the meantime, an entire generation grew up feeling estranged, living in urban ghettoes apart from the mainstream, and unable to take part in political life. Even well educated Turks who assimilated believe that stigma remains alive today. "There's this categorization ... that you are not the same as the others," said Demiragli, the social worker, who was born in Germany, but did not get citizenship until she was 16. "That is a feeling that grows in you if you do not have strong parents who can support you and give you the feeling that you are still special." Overt discrimination has abated since the 1970s and 1980s when real estate ads in German newspapers contained phrases like "Only for Germans" or "No Foreigners." But Turkish residents say subtle barriers remain. "Now it's more hidden," said Bekir Yilmaz, head of a Turkish community organization in Berlin. "You look for housing, you make a telephone call, you can speak German well, but when you stand in front of the landlord, they say, 'Oh, the apartment is taken.'" Yilmaz believes the problem worsened after the 9/11 attacks in the U.S. and the war on terror smeared the image of Muslims. "The West had its enemy in communism but communism is gone. Now it's the Muslims," Yilmaz said. "The Turks here are (not the) enemy. They have lived here for years, and their children (were) born here. This has nothing to do with reality." German attitudes toward immigration and citizenship also proved as an obstacle to achieving full and rapid integration. Although the attitudes are changing, Germans never saw itself as an immigrant society like the United States. German society values conformity. Unlike the United States, Germany does not automatically grant citizenship to anyone born on German soil. Even though shortened, the naturalization process still takes years, and requires knowledge of the German language and history. In 2000, a new law granted German citizenship to German-born children of longtime legal residents. By age 23, those children must decide whether to keep their German citizenship or change it to their parents' nationality. Chancellor Angela Merkel's government has refused calls from Turkish and other immigrant communities to allow dual citizenship. Many immigrants are reluctant to apply for German citizenship because they want to hold on to their original nationality. "I think we should have a dual citizenship here in Germany," said Ayvaz Harra, a German citizen of Turkish origin who sells bread in a Berlin market. "My family has property in Turkey and I would like to inherit it. Right now it's not possible." Others believe the core problem was the government's failure to foresee the long-term effects of the temporary labor program. "The problem here is that there is a picture of how Germans should live and if somebody is living differently, it doesn't fit," Demiragli said. "I think that in 20 to 30 years it will be a totally mixed community, especially here in Berlin. If we get over that 20 years, I think it will be a totally different situation." This is very interesting; I just read a comment in a different website a day or two ago about Turkish children in schools. The comment mentioned a very exceptional Turkish child in a German public school that had foster parents because his own father used to beat him, because the child constantly asked questions and the father felt inferior to him in intelligence. This is a shame but there are many parallels between Turkish people in Germany and Mexicans in America. I feel that Mexicans occupy their own areas of cities or towns, yet there is more integration within schools, and marriage. It will be interesting to see how the two countries handle this problem. I agree that Turks and Mexicans are very similar. I think the Turks are more centralized in a community than the Mexicans. Mexicans have their communities as well, but I don't think they are quite as large. I think this comes down to a matter of geographical logistics. Germany is a small country, thus the concentration of the Turkish community in a centralized area is more overt. America, on the other hand, is a sprawling landmass where diverse communities may appear less evident. When reading this article, I cannot help but be reminded of the recent BBC documentary we watched for class, "Racism: A History" because the goal of most major societies is to integrate immigrants. In one scene, the Austrailain Aboriginals were brought to Shark Island or "Point Civilization" where the goal was to integrate the 300 of the aboriginals who had lived without God or Christianity for 10,000 years. Instead, 260 died and the British felt it was better they died and learned of Christianity than live their "heathened ways." I see the relationship between Germany wanting to immigrate the Turks, and I, too, see the parallels of current immigration attitudes in America towards Mexican immigrants. I believe that racism and citizenship are much too heavily intertwined. I find this to be very similar with Mexican immigration in the United States. They seem to face the very same discriminations and circumstances that the Turk's are facing in Germany. One part of the article I found very interesting was the statement that the Turk's are generally not willing to marry outside their own circles. That can be said about most people though. In a society, the races/religions generally tend to stick together. I don't know how accurate this is since I found it on Wikipedia but in 2010 in the US only 2.1% of married white women and 2.3% of married white men were married to a non-white spouse. Why should the Germans expect a minorty to do the same when most of the world does not? I also see parallels between this article and the topic of immigration in the United States. I think it is funny to note that when speaking of immigration in the US, everyone automatically focuses on Mexico. Immigrants from Mexico are our version of this Turkish labor force that Germany has brought in, yet Germany seems to acknowledge that they encouraged foreign labor, while the US tends to deny that. The part I found particularly interesting in this article was when Germany was described as not having the image of an immigrant society, unlike the United States. Despite this global image that the United States has the discrimination described is the same, if not worse in the US. You would think, being the melting pot we are, that our country would be the most understanding and accepting of others. And yet, when issues like immigration come about, our true nature shows. Historically, the most successful groups have been those who have proactively chosen to aggressively assimilate into a host culture, embracing its educational resources, adopting its languages, and abiding by its social norms, rather than isolating themselves through usage of their own languages and restrictive customs. Countless examples of this litter the pages of history books. The Celts successfully integrated into Roman society with these tactics, ultimately becoming more Roman than the Romans themselves. Such assimilation led the Celts to positions of great power both politically and intellectually. I LOVED your post, especially the way you ended it. It was awesome. The only area of disagreement I see is in your discussion of American jobs. Many Americans use that excuse to cast a negative light on Mexicans, but how accurate is that? It really is only an above surface conversation. I say that, because beneath the surface there seems to be a more realistic conversation that revolves around jobs that Americans do not want and certainly are not willing to do for the meager wages that Mexicans are. So, on one hand we covertly invite them here to do the work the citizens refuse to do and then we overtly tell them they shouldn't be here. Please come help us, now GO! I see the parallels between the two countries and their immigrants as a failed project of cheap labor that just won't go home. Historically speaking, when this country has experienced times of wealth and a need for a larger labor force, we have opened our doors to immigrants. When those times turned sour and the economy took a hit, we quickly close the doors and want all of the foreigners to leave. I continue to be amazed in human history, of the times that a group of people have migrated to a new land and expected the original inhabitants to assimilate into the new culture. How dare we? I agree that in terms of monetary success and relatively comfortable living, those who assimilate are the most successful as someone else in here has pointed out, but at what cost? Why? Why should ANY culture be so arrogant as to think theirs is the only way? It is unfortunate to think that is how this country was founded, and in many ways, though more subtle than 200 years ago, it still operates very much the same way. I think you are right that we are extremely arrogant in expecting that immigrants relinquish all aspects of who they are. I don't know how many times I have heard people say that Hispanics should not speak spanish they should speak english if they are in "our country." Do we go to their countries and speak their languages? It's an unreasonable expectation! I am in agreement with you about the arrogance in expecting people to give up who they are to conform. People should be able to be who they are with out discrimination or oppression based on those differences. I am torn with the language issue because I have always thought that if I were to move to another country say Italy or France, then I would expect to have to learn the language of that country. Not as a method of conforming, but for the basic survival and functioning within that country. So when talking about language, I don't think it something to discriminate against, but there should be ample opportunities for learning English when in an English speaking country, especially free to those seeking citizenship from an impoverished country. I think programming and support is one way to help. But I still stand firm on learning the language of the country lived in. It seems to always be the case that when we need people to do labor that we ourselves consider demeaning or too much physical effort is required we look to other countries to come and do the work we would never do. This has been this true throughout the history of the United States and after reading this article it is apparent this is also Germany's history. If people are willing to work for another country they deserve the benefits of citizenship. I am not an immigration expert but I think that having to work in a country for fifteen years before being offered citizenship is ridiculous! I do not however think that dual citizenship should be granted. The reason I say this is because instead of separating the world into countries where dual citizenship is acceptable and those where it is not, it is best to only allow people to be citizens of one country. Dual citizenship would create multiple problems,for instance, Would there be an issue with an individual being a citizen of the United States and Canada? Probably not because many of our ideals are the same. On the other hand, would it be acceptable to be a citizen of Iran and the United States? Most likely it would be due to the huge difference in ideology. This would create privilege for some and disadvantage for others so I think it is best to avoid the idea altogether. I tend to agree with many of the posts above. It does seem as though there are a lot of similarities between the Turks in Germany and Mexican immigrants in the US. It is so unfortunate that lots of the "undesirable" jobs go to immigrants; at my high school, every janitor I saw was Hispanic, and many spoke little English. I later found out that some of them were getting assistance learning English from Spanish teachers in the school, and that if they had not already earned their US citizenship, many were on their way to doing so. Whenever I think about the issue of immigration, I tend to think of people whose homeland is in a state of despair, where they are not able to find work or perhaps even unable to feel safe in their own homes. In these cases, coming to a place like the US is a dream, and I think of the novel Bright Shiny Morning by James Frey, which details, among several mini stories, tales of Mexican immigrants and their first generation American born children trying to make a life for themselves in a society that continually shows them disrespect and inequality. Despite these unfortunate conditions, it seems that many immigrants are still happy to be here in the US because they have that "American dream" to hold on to. What I'm getting at is that it seems to me immigration can be a glamorous and uplifting idea for people, but that once they have actually committed to such a life-altering decision the grass may not be greener on the other side after all. It takes such hard work and dedication to achieve citizenship, and as someone else commented it is ridiculous that one can work in a country for 15 years and still not be considered a citizen. In a perfect world, people would be able to choose where they want to live and have every right to do so, to find work there and send their children to a local school without fear of deportation. I understand that immigration worries some Americans because they fear that with an influx of new citizens, jobs will be harder to find, but I would ask those people to consider the conditions that these immigrants are coming from. Everyone needs to eat to survive, everyone has the right to a roof over their heads, and if we deny that opportunity to people by making them jump through hoops on the road to being US citizens then what have we become as a country? This was a very interesting and insightful posting. It is good to see the immigration issues arise from another country but the US. I don't mean this by saying that the issues such as these are good for the country, but in that the US and Germany may help each other by working together on such issues. It is true that it is much harder to send the immigrants back to their foreign land after being either in Germany or the US for so long; it is unfair to those immigrants. Now how did these countries did not see this issue coming, assuming that the immigrants will come and work the low wage jobs for a few years and go back to their homeland? If there isn't a policy for that, the government should not expect the better. I also think its absurd how much discrimination there is for the immigrants, for example Latinos in the US and Turks in Germany. Both of the ethnicity get discriminated against in these lands that they work for. There is so much stigma going on in the world, so much media portraying different people of different cultures in the exaggerated manner, so much hatred toward people who "don't speak our language," or "don't look like us" or have different religion and traditions, that we forget that we are are one people. An example where Mr. Yilmaz was talking about how for instance one can speak the language well, but when seen by the landlord face to face, they are rejected for the apartment. This article also talks about discrimination being more hidden now. For example since the 1970's and 1980's there were would be ads saying "Only for Germans" or "No Foreigners." That was straightforward, but slowly it has become of a hidden thing. A lot of times it feels like that is what discrimination has become, in the backstage, until something big comes up. This is again seen in both the US and Germany. I believe though, that by looking at Germany, that has similar immigrant issues that the US is experiencing, they can help each other out with these problems in the hopes of lessening the discrimination. In this article, I see a lot of parallels between Germany and the United States. The Turkish people are discriminated against for being immigrants. They did not speak German, but had immigrated for the purpose of finding work. I think it is very sad that Germany has still not implemented a dual citizenship program or tried to make the German people learn the Turkish language. In the United States we have Spanish programs so that people are able to learn Spanish and work with Spanish speaking people. As far as the Turkish people being discriminated against when they try to buy housing, I remember reading about similar situations in which African Americans and Hispanic people face similar situations here in the United States. African Americans and Hispanic individuals are being forced to live in areas that are impoverished because they cannot afford to live in more affluent areas. They are discriminated against and must work jobs that pay less and therefore make less money than the average White person. Picca and Feagin speak about the move of racism from the frontstage to the backstage in their book “Two-Faced Racism,” and I believe that this may account for the general “disappearance” of racism against the Turkish people. If this is indeed what has happened, racism has not actually disappeared but has become more evident in comfortable family and friend settings, while racist expression becomes hidden from public situations. Honestly, it is going to be an extremely difficult transitional period to get rid of racism. If racism is occurring to this in other countries, I believe it to be truly an inherited human condition to discriminate against others. This was a real eye opener for understanding human nature in general. It's not just an "American" problem, it is a problem of certain people being given unearned privilege and using it against those who do not have it. It is sad to see the same problems we have here between the American and Mexican border in the German and Turkey border. It is a real difference in culture where one person feels their culture is superior to another. Why should immigrants have to let go of their heritage and integrate in order to live in a place they were not born? I think about people who move from places like Texas to New York or Boston. Each place tends to have a unique culture, food, accents, etc. Most of the time when someone from such a place moves to say Colorado, they are appreciated or valued for their difference. My neighbor is from New York city. I love to listen to her talk with her strong New Yorker accent and talk about her life in the big city. Why can't we do the same? Appreciate our differences, learn from one another. My biggest issue with the American/Mexican borders has always been the fence. Why do we have a fence on that border and not on Canada? Then I am forced to think about what "type" of people are represented on either side. Sadly one side are more like "Us" and the other side is different. It's an obvious problem. I'd like to thank you for this post. I was able to gain new perspective regarding integration. I hadn't considered looking at varying countries as varying states within the US. We are free to move around (taking with us our own customs, traditions, peculiar ways of speaking), and we don't face adversity for our differences (at least not as much). I'd also like to thank you for including that we don't fence out Canada. I've never been far enough North to know. You're right. It is a problem, and this article is increasing the awareness that will help everyone to make their second step towards change. It seems like there is a missing piece from the universal role of “Give and Take.” Germans only took the help from Turkish but did want to help them. After WWII, Turkish came to Germany to assist in rebuilding the country. After the all disaster was cleaned up, Germans want Turkish immigrants to go back: “That was the biggest mistake: to think that if you don’t need them, they will go.” Moving to a foreign country for making money or other reasons requires the people’s life. Turkish immigrants cannot move only their body one country to another. While they were rebuilding Germany, their life was also rebuilt in German. Human resources are not the same as those of a machine. It is not like that you borrow when you need and you bring it back when you are done. The Turkish were there when Germany needed them. Now it is Germany’s turn. 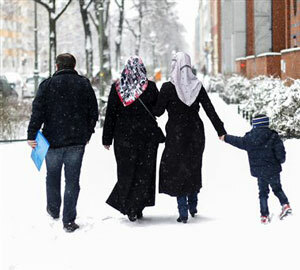 Germany needs to offer special policy for Turkish immigrants without second concerning. I think we can learn a lot from germany based on this article about immigration. The United States was founded on as a "melting pot" of people. Its time for regulation and learning from others so we can gain some respect back from mexico and her people. I describe this relationship as a mirror, but perhaps this could also be history. It's not the history of the United States, but that hasn't stopped anyone from trying to understand the cultures of other places both past and present. This is an article that many different individuals should read. Why? It raises awareness of something that could potentially alter the lives of millions. One of my fellow classmates (perhaps more than one), have suggested that it's a shame that Mexicans whom are illegal immigrants have to adapt their lifestyles, abandon tradition, and possibly learn a new language upon moving here. I wanted to share my father's argument regarding this matter. I'm neither in agreement or disagreement of anyone's beliefs. He puts emphasis on the word "illegal". They're illegal, they shouldn't be here in the first place. They shouldn't have voting rights, and they need to leave. He's entitled to his opinion. I support diversity, and I try to listen to the ideas of all. The idea that we want them when we need them, and then want them to leave when their services are no longer needed was not just used in Germany. The United States has been doing that to Mexicans for years. Not only that, but whenever there is economic turmoil the problem is blamed on immigrants, just like in Germany. I met a German woman about 10 years ago that told me that Germans see Turkish people the same way that we see Mexicans, and that is as more of a problem. I agree. people in America complain all the time about Mexican immigration, but we are more than happy to take their cheap labor. It's a custom in America that we complain when it's convenient. I don't care what's going on in the world as long as it doesn't affect me. As soon as I'm affected, then I start whining. It's the same with immigration. People need to start taking active interest in their nation, and not just making a fuss when it suits them.